Liam practices in the areas of complex civil and commercial litigation in Connecticut’s state and federal courts. Liam has experience in a wide range of areas including securities litigation, complex commercial contract litigation, products liability litigation, construction litigation, business torts, restrictive covenants, unfair competition claims, intellectual property litigation, tax appeals, commercial foreclosures, class actions and white-collar criminal defense. Liam has experience representing lawyers in grievance defense, ethics and professional responsibility matters. 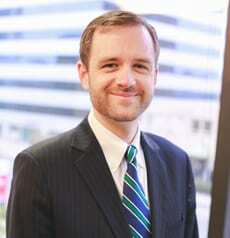 Liam routinely serves as local counsel for out-of-state attorneys on matters pending in Connecticut. Liam also has experience in securities fraud matters brought under the Securities Exchange Act of 1934 as well as claims under various states’ blue sky laws. Liam has been involved in complex disputes related to information technology, banking, and failed securitization deals. In his criminal practice, Liam has represented individuals in state and federal courts including representing subjects and witnesses brought before the grand jury and in proffers to prosecutors in the United States Attorney’s Office. He has represented clients in criminal matters involving expense reimbursement fraud, tax fraud, wire fraud, mail fraud, and bank fraud.